Even though I never fly American Airlines, the offer on the Citi® / AAdvantage® Platinum Select® World Elite™ Mastercard® certainly has me interested in applying! The card currently comes with a welcome bonus of 50,000 American Airlines miles after meeting minimum spending requirements. That could be worth $1,000+ in airfare! You can apply for the Citi / AAdvantage Platinum Select World Elite Mastercard here. The Sign-Up Bonus Alone Is Enough for 6 One-Way Short-Haul Coach Flights Within the US. 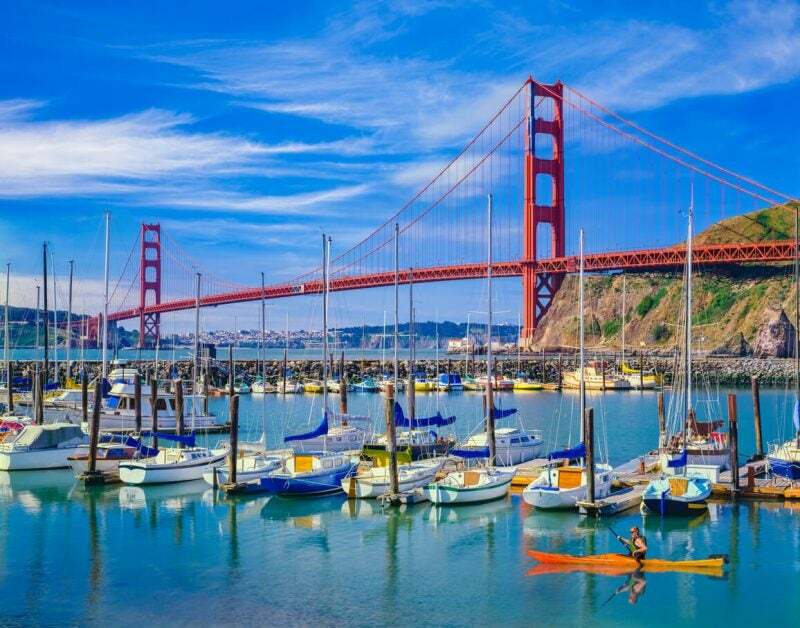 So I Could Take a Quick Trip to San Francisco, Without Having to Pay for My Flight! If I decide to apply, here’s how I would use those bonus miles! American Airlines has a region-based award chart. I love these types of charts because it’s very easy to figure out how many miles you’ll need for a flight. That’s because the number of miles required is based mainly on which 2 regions you’re flying between. American Airlines also offers reduced mileage awards, where you can book flights for less than the normal going rate. With these award tickets, you can save up to 7,500 American Airlines miles round-trip depending on which American Airlines credit card you have and where you’re flying. The list of eligible destinations for reduced mileage awards is updated monthly and includes a very large number of locations. So be sure to check back frequently to see if you can find something that fits your travel plans! I love that short-haul coach flights on American Airlines can be booked for as few as 7,500 miles one-way. I’ve taken on quite a few extra tasks in recent years, like volunteering for my alma mater’s alumni association, starting a new business, and additional responsibilities for my regular 9 to 5 day job. So it’s unlikely I’ll be able to take more than a few days off for vacation any time soon. That means I’ll have to stick to traveling close to home! 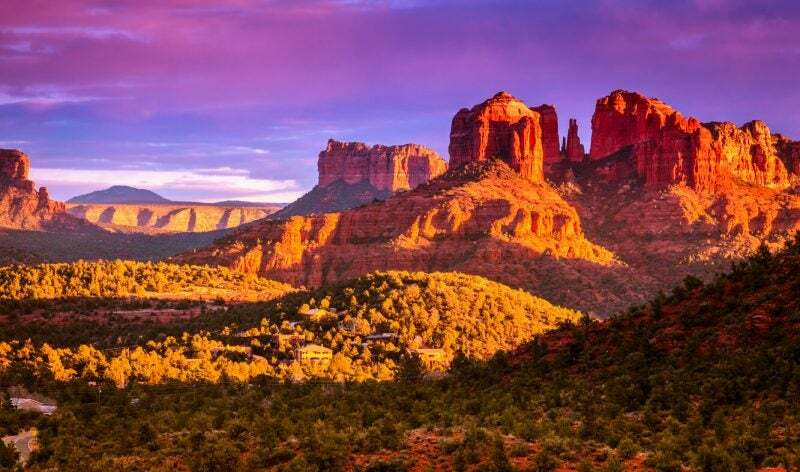 I’d Use My American Airlines Miles for a Weekend Getaway to Arizona! With the 50,000 American Airlines miles I’d earn after meeting the minimum spending requirements on the Citi American Airlines Platinum Select card, I’d have more than enough miles for 6 one-way short-haul flights within the US! From where I live in California, I could fly for nearly free to spots like San Francisco, Arizona, and Las Vegas. And I’d be able to have a quick weekend getaway once every 4 months over the next year, without having to worry about airfare! I usually fly coach because it’s the cheapest option, regardless of whether you’re using cash or miles. I’d love to try Business Class on a long flight to Japan as a way to treat myself. And the sign-up bonus on the Citi American Airlines Platinum Select card is nearly enough to do just that! You can book a saver Business Class seat to Japan for 60,000 American Airlines miles one-way. 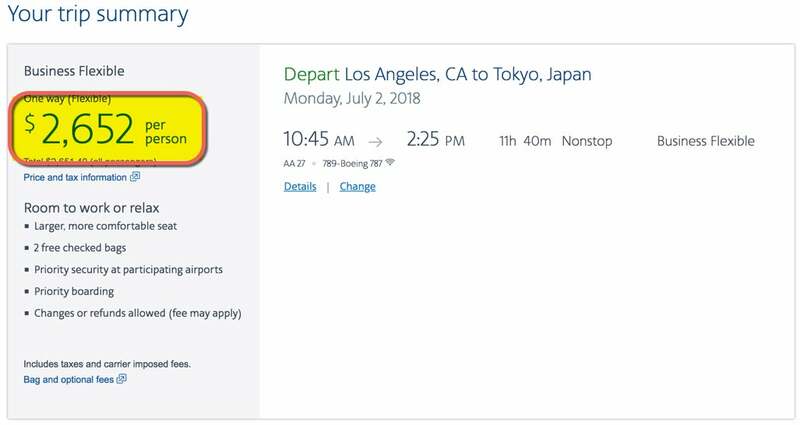 I did a quick search and found a number of available seats from Los Angeles (my home airport) to Tokyo this summer. Booking the same flight with cash would cost over $2,600! A Welcome Bonus Potentially Worth Close to $2,600? Sign Me Up! There’s no way I’d ever spend that much on a flight. But by using miles for a ticket like this, I’d get an incredible value from the Citi American Airlines Platinum card’s sign-up bonus! I’d just need to earn a few thousand more miles to make this trip. While the card does have an annual fee of $99, it is waived for the first 12 months! So you can try the card for ~11 months at no cost to see if paying the annual fee is worth it. There’s also a benefit for big spenders. You’ll earn a $100 American Airlines flight discount after spending $20,000 or more in purchases during your card year and renew your card. If you fly American Airlines a lot, the free checked baggage perk alone could be enough to make the card worth keeping. Even if you don’t fly American Airlines very often, the Citi® / AAdvantage® Platinum Select® World Elite™ Mastercard® is definitely worth considering! With this offer, you’ll earn 50,000 American Airlines miles after spending $2,500 on purchases in the first 3 months of opening the account. It’s an incredible welcome bonus that could get you $1,000+ worth of airfare! If I get the card, I’ll use the 50,000 American Airlines miles for multiple one-way short-haul flights within the US. Or put the bonus towards a free one-way Business Class ticket to Japan! How do you plan on spending the welcome bonus you’ll earn with this card? Let us know in the comments! You’re doing way better than me, i can barely find space on aa and never on iberia. Did you have to call iberia? Great idea to fly business to japan – one way. Getting home may cost you nearly the same as a return economy ticket. LOL at the title of this post…. sorry to say. About as disingenuous a sell job as you could have written. No mention of how incredibly hard it is to find award availability on AA…. Chronic well known problem; you could have at least addressed it, even shown Daraius-class color-rich arrows & circles showing us how you found availability for this or that obscure, late night flight. Or you could confirm that a miracle hath unfolded, that AA actually kept their promise, and opened up more award seating…..
All winces intended… Oh wait, I have another AA card offer in the mail… May get it…. as with the card, I can get discounted car rentals — on otherwise near useless AA miles.